Lithography, literally printing from stone, is a printing process which was discovered around 1797 by Aloïs Senefelder in Southern Germany. 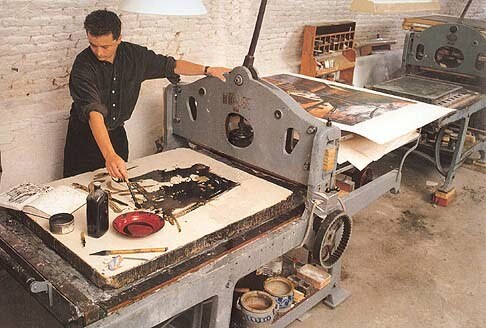 It is planographic, which is to say that the ink is on the same plane as the lithograph stone (the base). Lithography is based on the principle that water and grease repel each other. It works as follows. A wax crayon or ink is used to draw on a polished flat block of limestone which is approximately 12 centimetres thick. The stone is slightly porous an thus absorbs the grease from the crayon or ink. Nitric acid is then rubbed on the stone. The acid penetrates the stone where there is no drawing and ensures that no grease be absorbed in those areas. After 24 hours the preparation is dry and the stone ready for use. The drawing is removed with turpentine but the grease from the crayon or ink remains on the stone. The latter is dampened with a moist sponge. The parts of the stone where the drawing was are now covered in grease and therefore repel the water and remain dry. It is now possible to ink the image any colour with an ink roller. The ink only adheres to the dry parts of the stone. Once this has been done, a sheet of paper is placed on top of the stone and a press is applied with great force. The result is a print. The stone is again moistened and rolled with ink an this process repeated until the required number of prints have been made. In color lithographs, a different stone is used for each colour. First, all the prints are made with the first colour. Then the second stone is placed on the press and the second colour is printed sheet by sheet on top of the first colour. Then comes the third colour, and so forth.